Capital of Algarve Region, Faro is a popular destination for sun-seekers from northern Europe. The town of Faro has a reputation as being an overrun party beach town for much of the year. Visitors who use it as a base to explore the more remote areas of the Algarve in the off-season will experience much more of what southern Portugal has to offer; but those looking for no more than a tan and cocktails won't be disappointed. In winter, it is a beautiful, peaceful corner of Southern Europe with plenty of sun bleaching the white-washed town with Iberian and Moorish-influenced architecture. We were on our way in a private van from Alvor to Seville. Just about midway, the pretty town of Faro was a little detour and well worth it. It just took us an hour to reach Faro. With only a couple of hours on hand, the natural choice was to explore the old town. The van dropped us at the gates of the Town Arch and would pick us up again at the same spot at the designated hour. 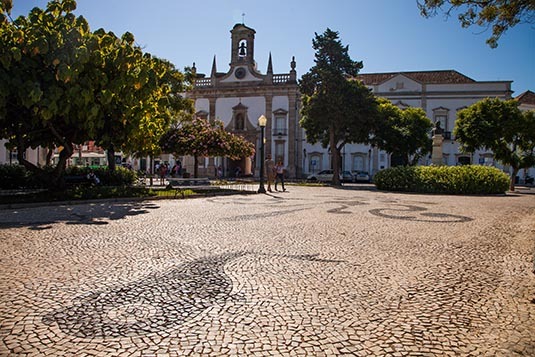 The Old City, or Cidade Velha, is a well-preserved section of town off the harbor with cobblestone streets and 18th century Portuguese and Moorish-influenced architecture. It is great place for a peaceful and almost private walk back in time in an area that has been virtually untouched by modernity. Negotiating Rua do Muncipal, we reached a main square that was home to the Cathedral and Episcopal Palace. 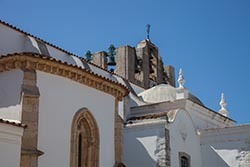 The Cathedral of Faro is a Roman Catholic cathedral. It was consecrated in the name of the Blessed Virgin Mary in the late 13th century by the Archbishop of Braga. 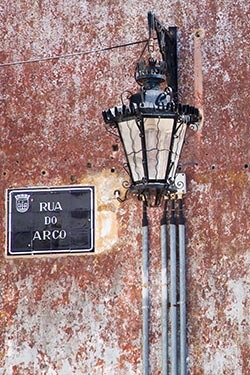 It has been the seat of the Diocese of Faro since 1540, replacing Silves Cathedral on the orders of King John III of Portugal. In 1596 it was sacked by the Earl of Essex. The cathedral now is a National Monument of Portugal. The Bishops Palace (or the Episcopal Palace) was built after the pillage and burning of the former episcopal dwelling by British Troops commanded by the Earl of Essex in 1596. It is one of the most relevant buildings of plain architecture in the region. The next hour we explored the many narrow cobbled-streets appreciating the walls and the creative facades. Entering through the New Door Arch, we reached the Ria Formosa Lagoon. A railway line sandwiched between the waters and the town looked pretty fascinating. The 10 minutes that we were there, I saw a few flights landing into Faro. That itself tells how busy the town is with tourists. It was time to turn back, but not before a quick bite at one of the road-side eating places and a little walk in the neighbourhood. As scheduled, our van was waiting for us... ready to cross the border and take us to Seville in Spain.